Last year we bought a second hand box trailer. It is small, 5′ x 3.5′, but it is being towed by our Saab 900i so I wanted a trailer a bit smaller than the usual 6′ x 4′. It was manufactured by J&P Trailers in November 1993. For light-weight, non-braked trailers like this there are 3 main types of coupling used. The relevant Australian Standards (AS 4177.3-2004 for the quick-release couplings and AS D18-1968 for the older style) do not specify hole spacings. Those quoted seem to be manufactures’ conventions. Varous sources specify from 100mm to 102mm for the quick-release 2-hole type. Ideally the coupling plate should be drilled using the coupling as a template, so the holes are a perfect match. But I doubt that happens often. The plate on our trailer has 3 holes to fit both sizes of 2-hole couplings. This is the older style coupling rated at 1000kg and with 2 mounting holes. Our trailer had this type. It uses a tapped star-nut for fastening which can be fiddly. 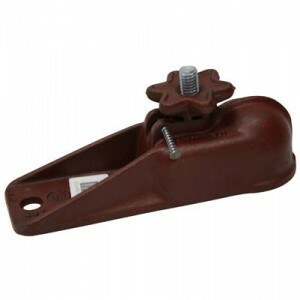 There is nothing to hang onto while hitching the trailer so you need to use the trailer drawbar. The hole centres are 65mm apart. 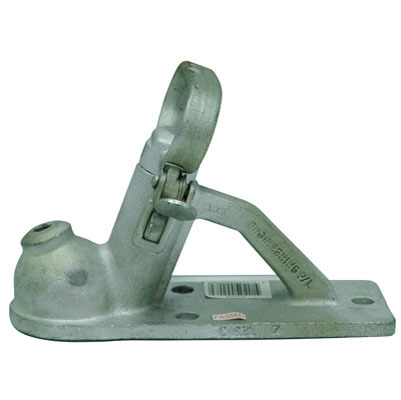 This type also has 2 mounting holes and is typically rated at 1000kg or 2000kg. It has a quick release mechanism and provides two places to hold it. The hole centres are 102mm apart. I bought one of these from Ark Corporation (catalogue no. 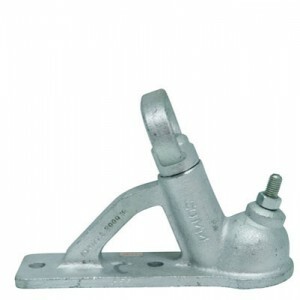 CAS22Z) who make good quality trailer accessories. This quick release coupling has 3 holes. Centres are 111mm and 52mm apart. This entry was posted in Gadgets and tagged Trailer on November 11, 2010 by Steven. When we bought our second-hand box trailer it had an old round plug and an adaptor so it could be connected to a more recent flat 7-pin socket. This worked ok but it was messy. The weight of the adapter meant that it needed to be secured otherwise it would hang down and sometimes drag on the ground. I decided to disassemble the adapter and replace the round plug on the trailer with the flat plug from the adapter. Fortunately it was a good quality adapter which could be unscrewed and reassembled. This meant I needed to understand trailer wiring. I used a tech tip from the GoSeeAustralia Caravanning Directory but I’ll copy some of the info here, just in case I need it again. The trailer does not have electric brakes or a reversing light so pins 2 and 5 are not used. This entry was posted in Gadgets and tagged Trailer on November 10, 2010 by Steven. Ea rly last year my LG U880 started getting hard to use. Some keys were not working properly – I’d have to press them hard which would really slow down my texting. I was well out of my contract period so I could have just ordered a new phone from 3, but none of those available on my plan really took my fancy. I’m on a cheap plan so I can only get the bottom model from each manufacturer. At that time I was offered a second-hand Nokia 6280. I wasn’t that keen on the slidey style (the LG’s clamshell style seemed more stable) but the keys worked well so I decided to use it until I found something better and newer. I can’t remember if it was already unlocked or if I unlocked it myself but either way it worked fine with my 3 sim. This Nokia was released about the same time as the LG I had been using, early 2006, so I had some idea of what to expect. The Nokia comes with a ridiculous 6Mb of internal memory which I think was tiny even in 2006. It has a MiniSD slot so I bought a 1 Gb card – gigantic for 2006 and about the smallest you can buy in 2009. I keep the phonebook, profiles, logs and messages in the internal memory but photos and videos on the memory card. My PC has a multicard reader so I transfer photos and videos via memory card. the camera is excellent. I’m amazed that what is essentially a high-tech box brownie produces such good quality photos: quite sharp, good colour saturation and it performs well in low light conditions. I’ve written some tips about editing the exif data. the display is clear and bright. the slidey mechanism is very loose. If I set it to vibrate it sounds like the phone is about to fly apart. It doesn’t seem to have got any looser over the months. I’ve read in forums that some people were worried about it and returned theirs as faulty. The consensus seems to be that it is just a characteristic of the model. the menu system is good except for the ‘Settings’ section. I can never find the right category for the setting I want to change. In particular I can’t really figure out the many display settings. And I don’t seem to be able to get the information I want onto the display. a minor irritation: when viewing a list of received text messages I can only see the sender and the beginning of the message. I’d like to see the date it was sent too. This entry was posted in Gadgets and tagged Nokia, Phones on February 4, 2010 by Steven. It works perfectly with our Minolta camera, but I also use my Nokia 6280 phone to take pictures. This phone is a few years old but it really does take a nice snap. From what is essentially a high-tech box brownie the results are excellent: reasonably sharp, high colour saturation and good in low-light. The only annoying thing is that it doesn’t include anything in the exif ‘Date picture taken’ field. This means that photos taken on the Nokia end up lumped together in the photo album rather then in correct chronological order with those taken using the Minolta camera. The jpg file has ‘Date Modified’ which is equal to the time the picture was taken but plogger can’t make use of that. So the problem is how to take the file’s ‘date modified’ and add it to the exif ‘Date picture taken’ field. I first tried jhead which is a command-line exif editor. It is great for jobs like adjusting the date on a batch of photos. For example, if your camera’s date/time has been accidentally reset and you have a big batch of photos with the incorrect date then jhead can be used to adjust the date or time by a certain amount. It can even take the file date and add it to the exif ‘Date picture taken’ field. Unfortunately it can’t do that if the field is completely absent from the exif header. jhead can create a new exif header with an empty field but that also removes any exif fields which do exist, such as Camera Model. Unfortunately this is a 2-step process, but it does work. This entry was posted in Gadgets and tagged Nokia, Phones on January 24, 2010 by Steven.